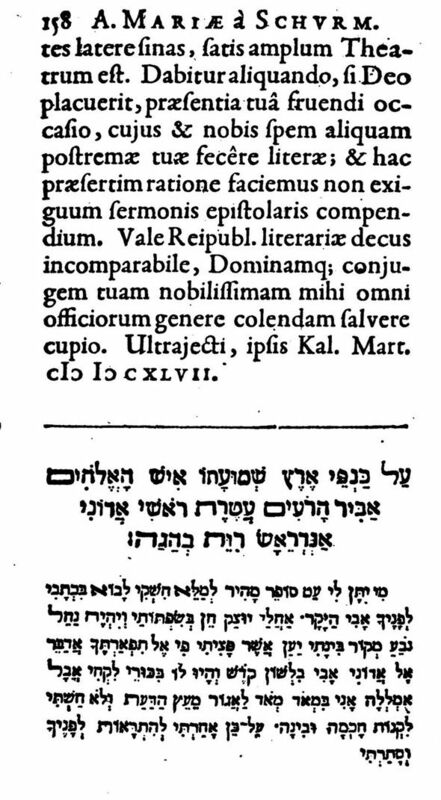 The selling of kibudim (honors) in London synagogues denounced in 1796. 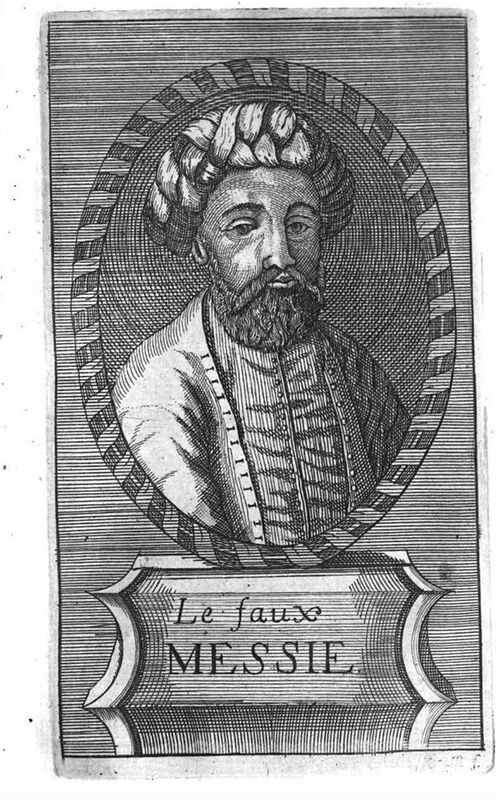 An Egyptian Pasha accuses Egyptian Jews, in 1700, of robbing Egypt in biblical times. Also see this post, this one, and this purported news story from 2003. 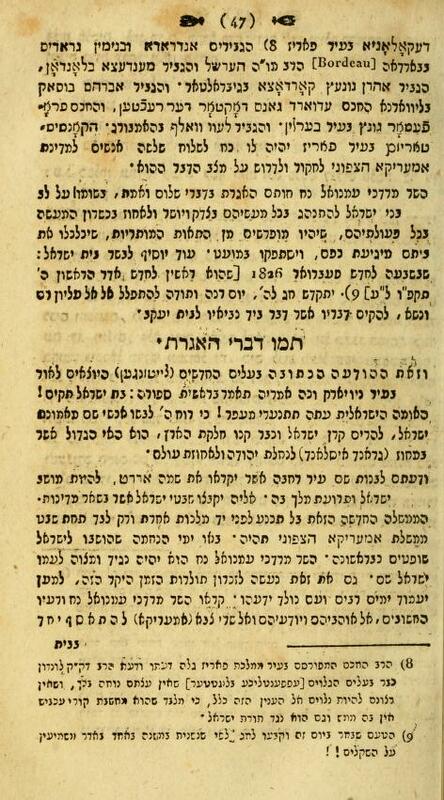 The canceled fast in Vilna for the Ninth of Av 5731/ 1871. How one of the greatest 19th century Christian Hebraists unwittingly inspired the true observance of Tisha B'av. 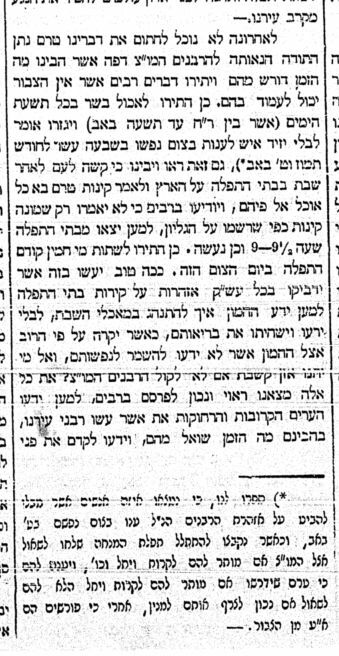 Some years ago Dr. Shnayer Leiman called attention to, and translated, a really interesting anecdote for the Ninth of Av buried in an obscure Hungarian rabbinic journal from the 1920s. 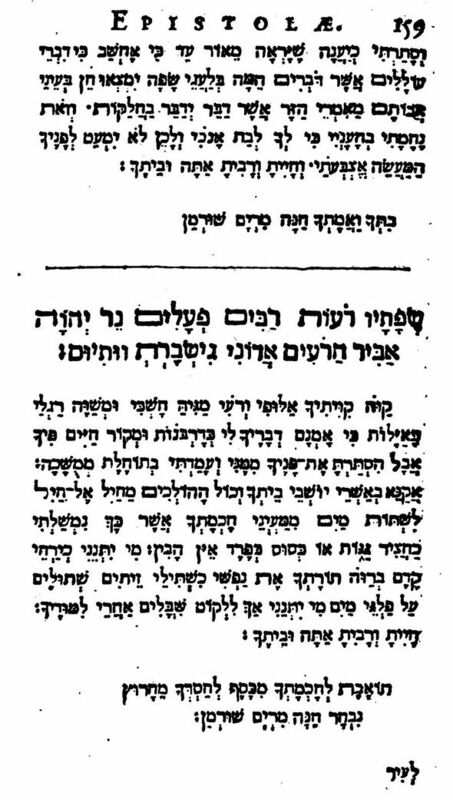 In brief, the great Orientalist Ignaz Goldziher told a young Leopold Greenwald, later to become an American rabbi and historian, how their teacher Franz Delitzsch paid a shiva call of sorts to him and Wilhelm Bacher on Tisha B'av. 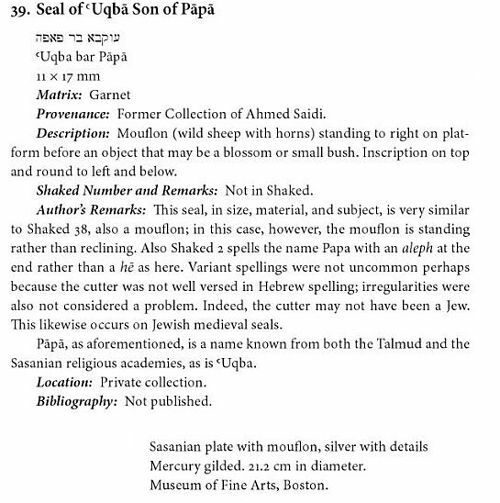 The journal is אפריון No.2 5685 (1925), and the translation appears in Tradition 25(4), Summer 1991, From the Pages of Tradition: R. Leopold Greenwald: Tish'ah Be-av at the University of Leipzig by Shnayer Z. Leiman, where all the biographical info of the participants are given. Tovey's own (way off track) guess was that it was meant to store documents. But my guess is that it was a 'tzedakah box.' צדקה תציל ממות. A Bet Din, 1920s style. 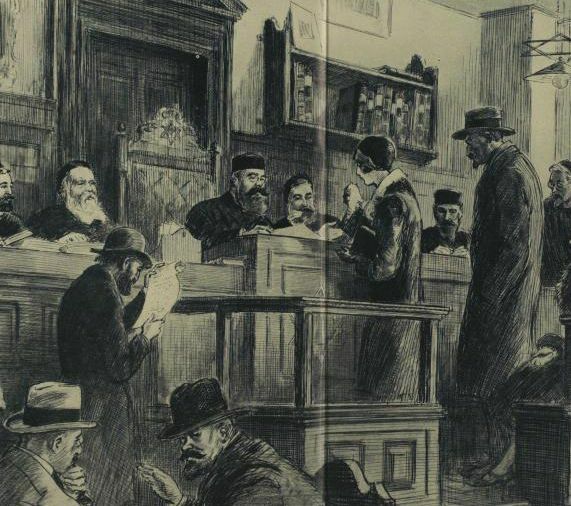 Here's an interesting depiction and description of the London Beth Din as it functioned in 1926. 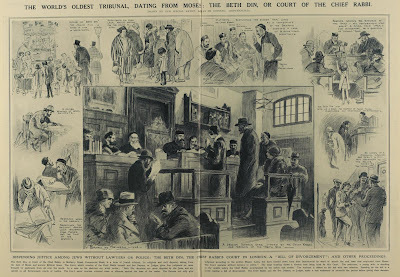 It is titled "The World's Oldest Tribunal, Dating From Moses, The Beth Din, Or Court of the Chief Rabbi." 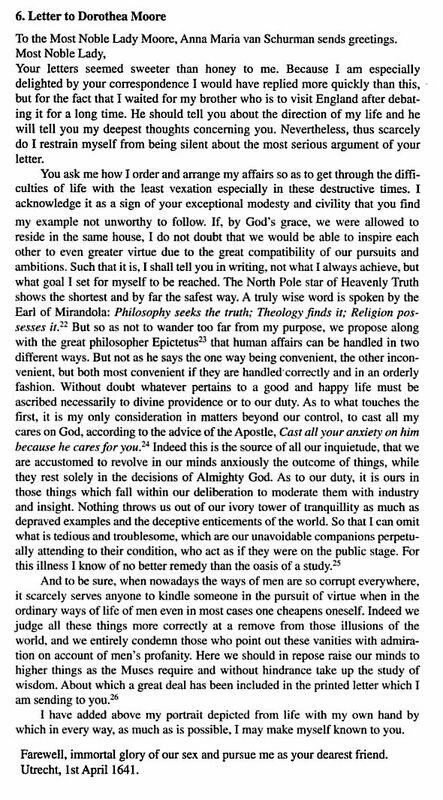 Click to enlarge and read. From the Illustrated London News, August 14, 1926. 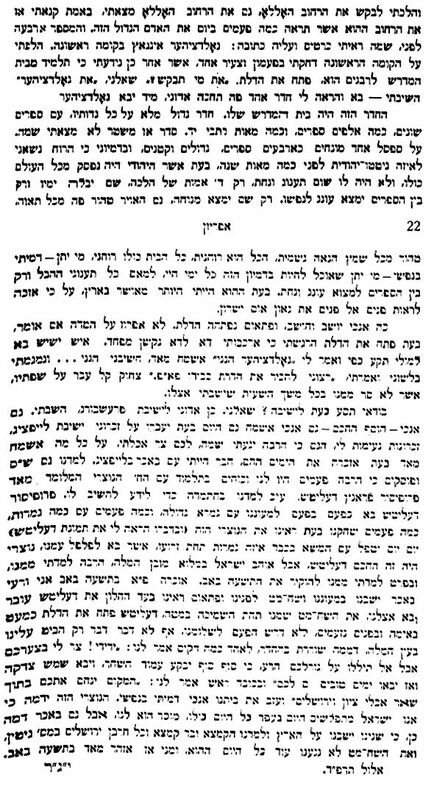 As many readers know, when a talmudic treatise is completed a litany of names is recited in the Hadran recitation, חנינא בר פפא, רמי בר פפא, נחמן בר פפא, אחאי בר פפא, אבא מרי בר פפא, רפרם בר פפא, רכיש בר פפא, סורחב בר פפא, אדא בר פפא, דרו בר פפא. But there's no יצחק בר פפא. 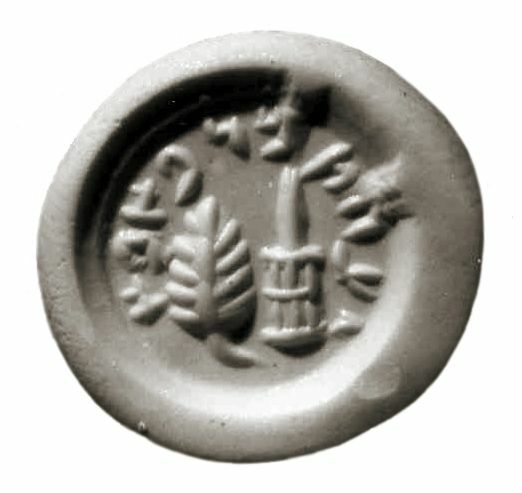 Here is a Jewish Sasanian seal (between 3rd and 7th centuries CE) described as: Lulav and etrog, with the Hebrew inscription, "Isaac, son of Papa". Copenhagen, National Museum, inv. 9470. Cornelian, 13 mm (note that פפא is spelled פאפא). Regarding spelling variants, I would just point out that there basically is no such thing as standardized spelling 1500 years ago. In fact there basically was no such thing as fully standardized spelling 500 years ago. To the extent that there is a canonical literature, spelling could be more standardized. For example, because of our Bible no one ever had a doubt how to spell a name like יהודה or משה, but newer names and words could be challenging and subject to the whims of the writer, who had no official dictionaries or lexicons to consult. 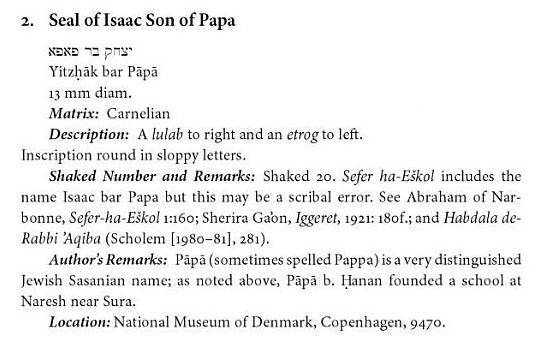 That's why "Akiva" was spelled עקיבה or עקיבא, and there are many variant spellings in all languages. Interestingly, there appears to be a Ge'onic variant of Kiddushin 70b's יהודה בר פפא ממזירא which reads יצחק בר פפא ממזירא, which is supported by the Munich Talmud MS. See אוצר הגאונים. 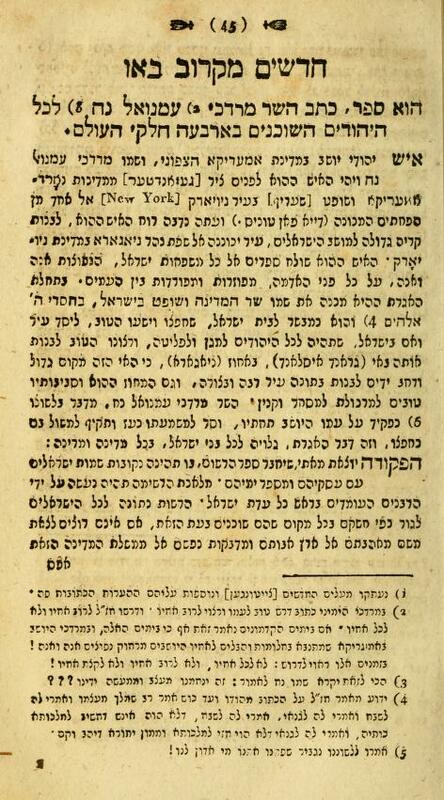 Developing the Hebrew name for the United States over 150 years ago in a Haskalah school book printed by the Romm Press of Vilna. 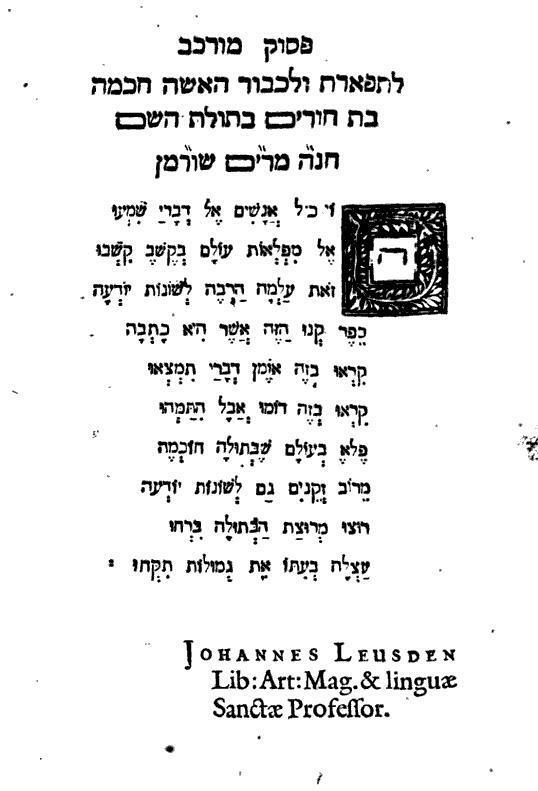 Here is a very interesting book, an 1849 work by Aryeh Leib Mandelstamm (1809-1889) called אלף-בית והוא ספר חנוך נערים ללמד בני-ישראל ספר ולשון מוסר, or Alphabeth, Ebraisches Elementarbuch von Sr. Erlaucht, dem Herrn Minister der Volksaufklaerung in its German title. This was a two-volume Haskalah text book for youths, printed by the famous Romm Press in Vilna. The author was Max Lilienthal's replacement, in charge of Jewish education, when the latter left Russia. 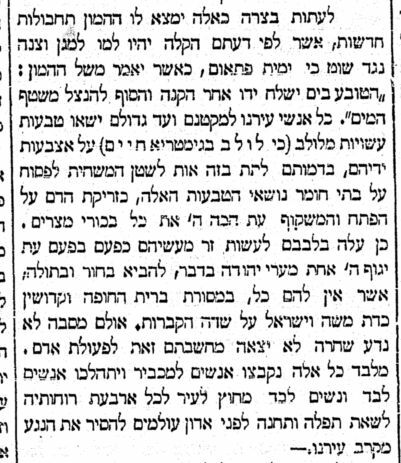 Readers might also be interested to note that he recommended Rabbi Yisrael Salanter to head the proposed Rabbinical Seminary of Vilna, an appointment which the latter emphatically rejected. It is interesting to speculate why Mandelstamm thought he would accept such a position. (Also see here). Why mention all this? Because many people wonder how it is that our cursive ש often looks like very much like a lower case e. As you can see, it is in fact basically the same form as the ש in the Rashi script, but the loop is closed to facilitate writing more quickly. Will you be my Hebrew pen pal? 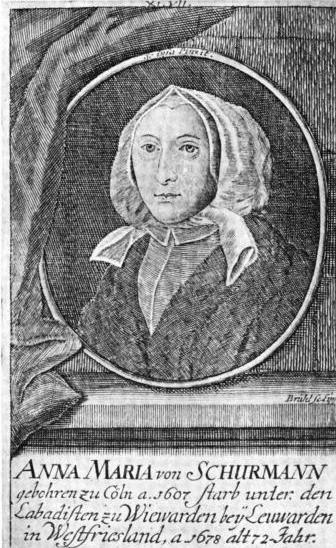 "Chana Miriam Shurman," a 17th century Christian Hebraist. Moritz Steinschneider, who has been called "the father of Jewish bibliography," supposedly  quipped ראשית חכמה—ביבליוגרפיה. 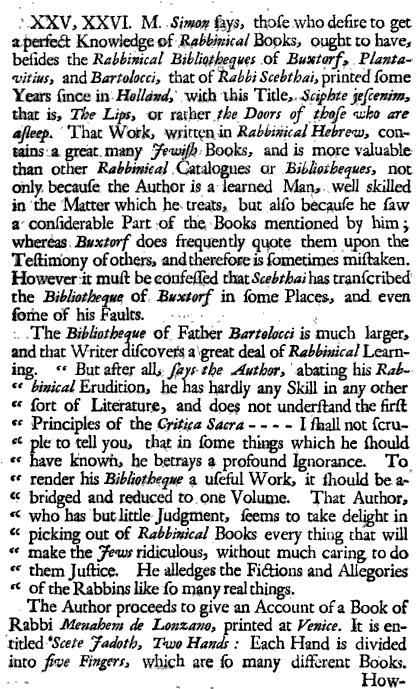 Whatever one thinks of the impious biblical parody (Psalms 111:10 and Proverbs 9:10) there can be no question that bibliography is immensely important in scholarship unless your scholarly path is to choose a few classics to which you always refer. Thus bibliographers are deserving of an enormous thank you. 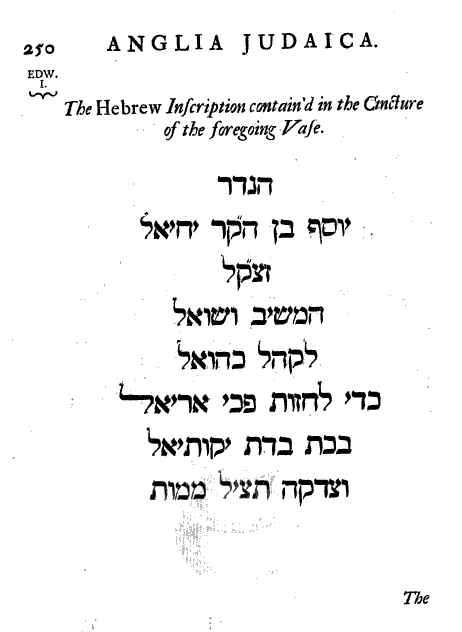 It is surely interesting that he does not limit himself to seforim, that is Jewish, rabbinic works, but also includes a section called שער החיצון, or Outside the Canon, listing Hebrew works by Christian scholars. Below is the small introduction. 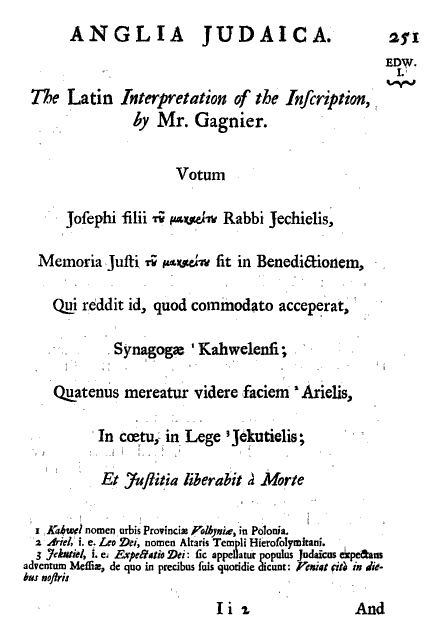 You can also see the very first work he lists is an אבן גליון, or Evangelion, that is Elias Hutter's Hebrew translation of the New Testament Gospels. 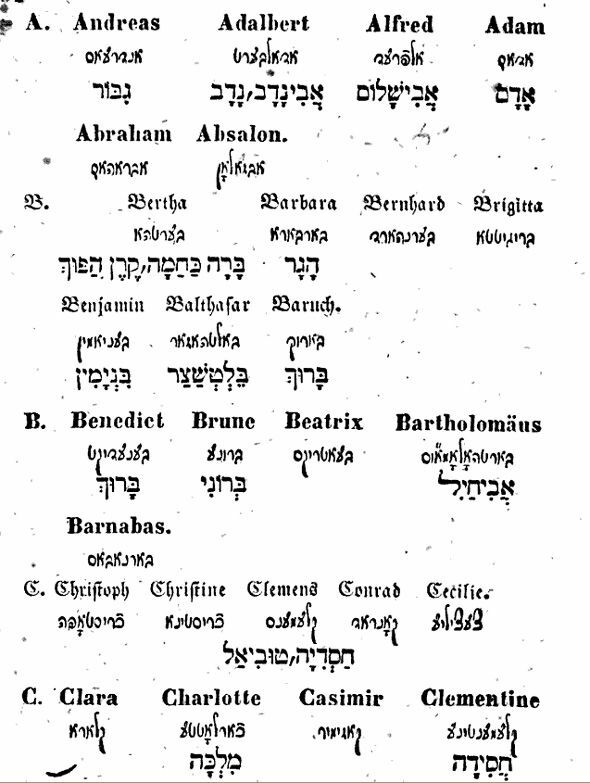 Writes Bass: "Here are listed many works translated from Hebrew to Latin, and some which are written in both Hebrew and Latin. These authors are not Jewish. This shows the power of Hebrew, that all the nations exert themselves to learn and write works in the Holy Tongue, and to translate books from Hebrew into other languages. The wise will understand the great purpose of this chapter." 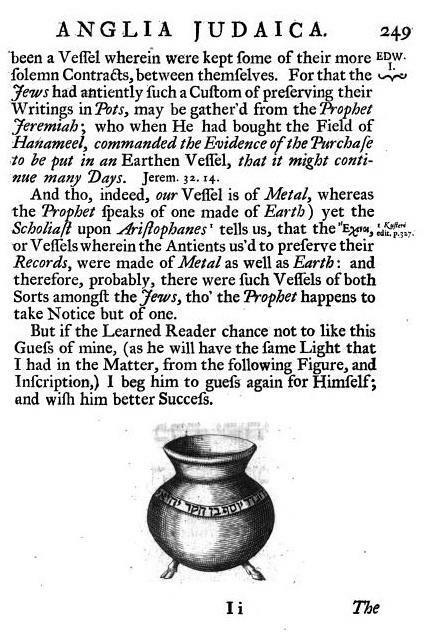 So it is that the acquisition of Hebrew by Christians was appreciated as notable by at least some Jewish scholars. 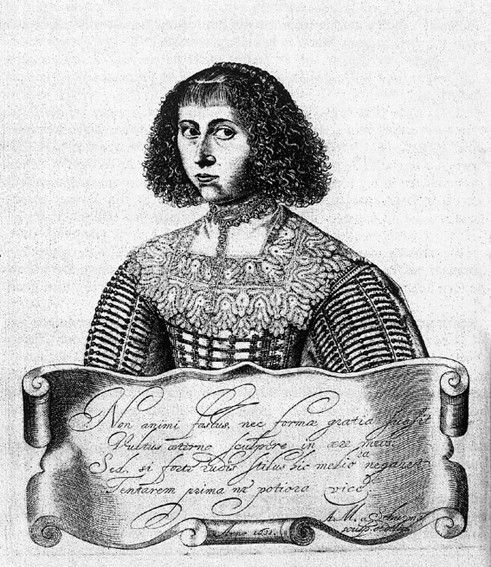 Anna Maria Schurman (1607-1678), depicted above in 1632, was a legend in her own time. Originally from Cologne, she lived in Utrecht in Holland, and quite naturally was a Calvinist. From a very young age she became accomplished in the major European languages, as well as Latin and Greek. She developed a propensity for scholarship, which was considered nothing short of astonishing in her time. As the best Latinist in town, Gisbert Voet (1588-1676), Rector of the University of Utrecht, invited her to write a Latin poem for the occasion of the opening of the University. As a result of this a friendship developed between them and he taught her Hebrew. From there she progressed to Aramaic and Syriac. Because of her scholarly prowess and intense curiosity Voet had a special booth built for her to audit lectures at the University. 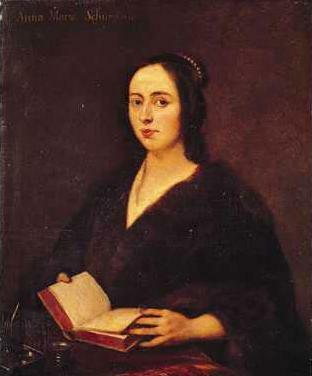 She became acquainted with Rene Descartes ("I think, therefore I am") who enjoyed discussing scholarly topics with her, and sitting with her to listen to lectures. One time he entered the booth and saw she was reading the Bible in Hebrew. Descartes, a Catholic, asked her why she was wasting her time over something so unimportant? She gave some kind of answer about the supreme importance of the original Hebrew for understanding God's word. In reply, he remarked that he had thought as she did and even learned the language himself. When he tried to read the first chapter of Genesis dealing with creation, instead of comprehending God's great wisdom he just found it to be very incoherent. She was extremely upset by his flippant attitude toward the language which she considered to be of infinite importance, and her attitude toward him cooled considerably. She never invited him to join her in her booth again. Another interesting anecdote concerns the time that Queen Christina of Sweden, having heard great things about her, visited her accompanied by Jesuit priests. Christina was fairly scholarly herself, and saw she was unable to baffle Anna Maria on any topic she posed to her. So she asked the Jesuits to ask her some tough questions about theology, and they also couldn't stump her. They were so surprised by her quickness and cleverness that—you can't make this stuff up—they told Queen Christina that she must be possessed by an evil spirit. Anna replied by laughing and agreeing that she was inspired by a spirit. The friendly visit concluded with Anna quickly painting the Queen's portrait for her. 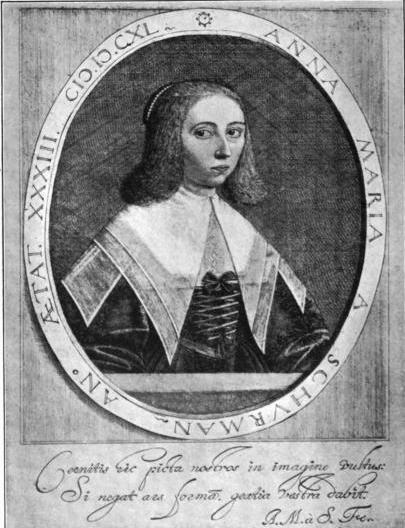 As you can see, Anna Maria Schurman signed her name חנה מרים שורמן, Chana (=Hannah) Miriam Shurman in Hebrew. Before I get to the content of the letters, it is interesting to note that she never married and as a chaste, pious woman she was often referred to as a "Maid" or even a "Virgin," (and you will see an example in Hebrew contemporary to her time below). It's interesting that in Bikure Ha-ittim she is referred to as עלמה חכמת לב, because while it is correct, if she was referred to as an עלמה by her contemporary Christians it was meant in the sense of virgin, a meaning which Jews do not accept as valid for that word. I think a case can be made that the editor unwittingly made a sloppy choice here. The third of these letters is most interesting. 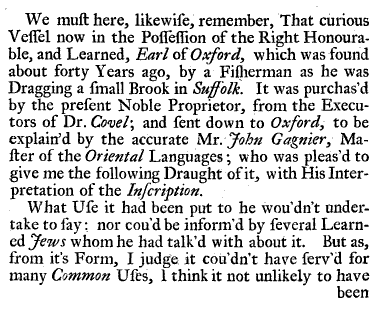 Shurman was writing to a woman named Dorothea Moore (1613-1664) of Dublin and essentially requesting that she be her Hebrew pen pal. She praises Dorothea, telling her that wisdom is only to be found among English women in her now that Lady Jane Gray (גברת יוחנה גריה) and Queen Elizabeth (מלכה אלישבע) are dead. The other letters are to Andre Rivet, who was her mentor, and the aforementioned Gisbert Voet. I can't verify this quote. Louis Jacobs was fond of repeating it in the name of his teacher, Dr. Siegfried Stein, who attributed it to Steinschneider. Come my beloved, let us greet the Bride, let us receive the presence of Sunday; a vintage parody of Kabbalat Shabbat for Sunday in 1846. 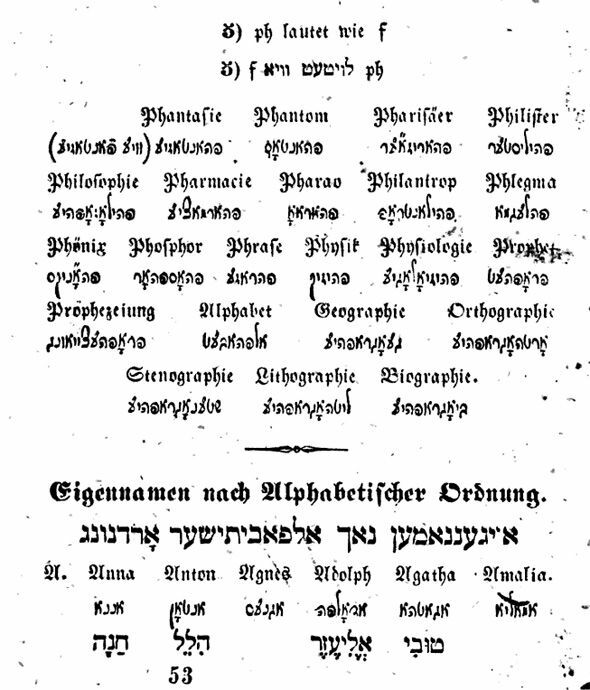 On August 8, 1846 the Literaturblatt des Orients published the following parodic criticism of recent steps in German Reform Judaism, especially the desire to move the Sabbath from Saturday to Sunday. 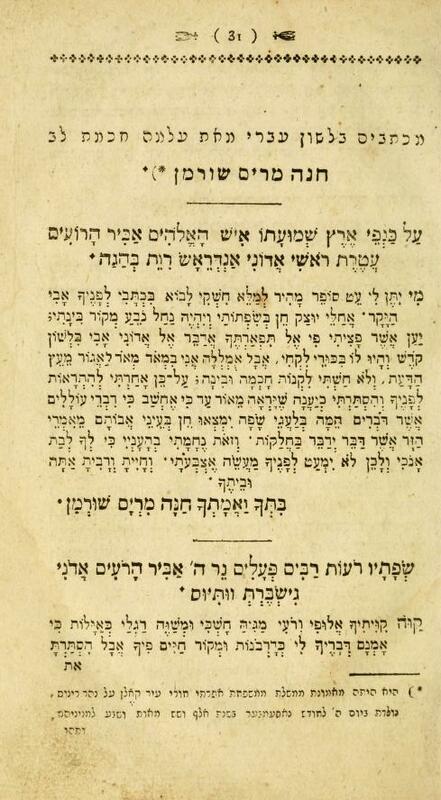 It was penned by the self-styled Moses Mendelssohn of Hamburg (surnamed Frankfurter; 1780-1861; he happens to have been Rabbi Samson Raphael Hirsch's paternal uncle. For more info see here). After being introduced by a fake quote from a mystical passage concerning how one is to conduct oneself on Erev Sunday (hint: it includes tobacco), and a Talmudic passage (in the "German Talmud," not the "Babylonian" or "Jerusalem Talmud") complete with a gloss from "Tosafot" ("Why does it say that whoever drinks aged wine on Erev Sunday will merit the Emancipation and not the coming of the Messiah?Answer: this is according to the view that there is no Messiah"). 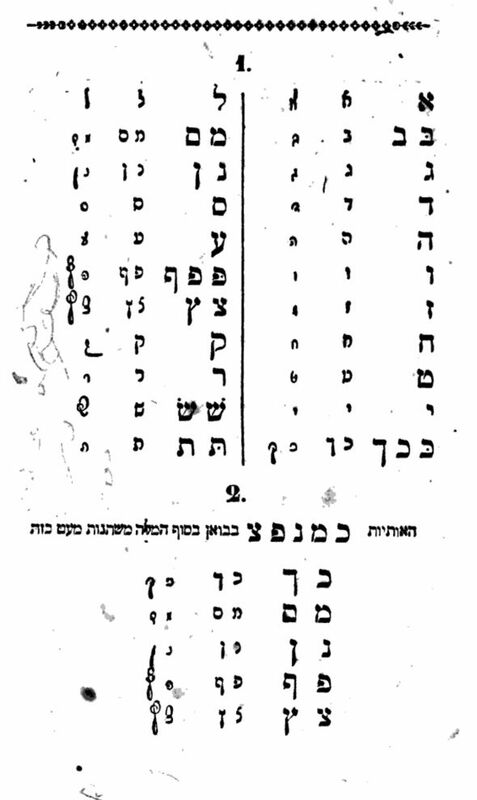 The piece gives instructions leading all the way up to the recitation of Lecha Dodi in the synagogue, and his parody of Lecha Dodi follows. 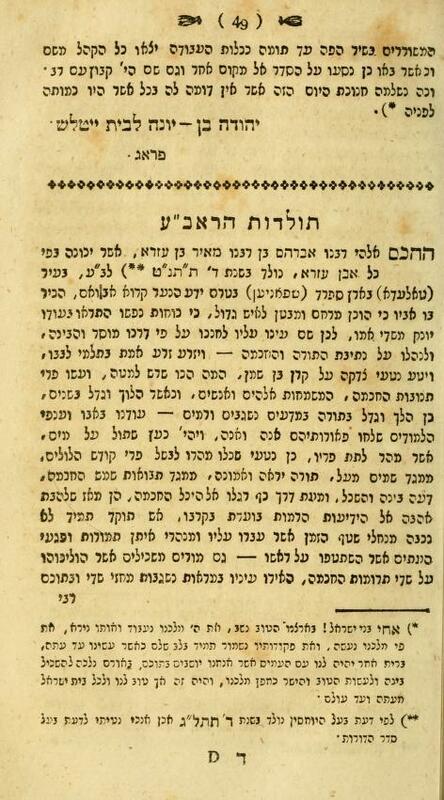 Chassidic rebbe bashing from 1845. 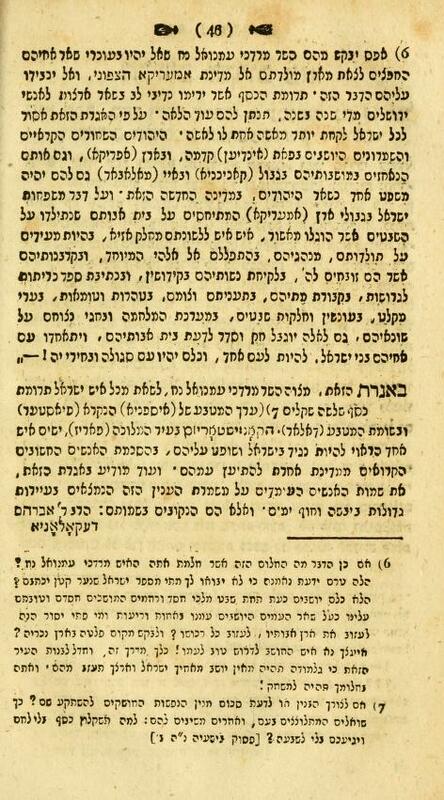 Here's some nasty and crudely written bits of gossip about Chassidic rebbes in Galicia, such as R. Meir'l of Premishlan (Przemyśl) and Harry Maryles's ancestor R. Shimon Maryles of Jaroslaw. 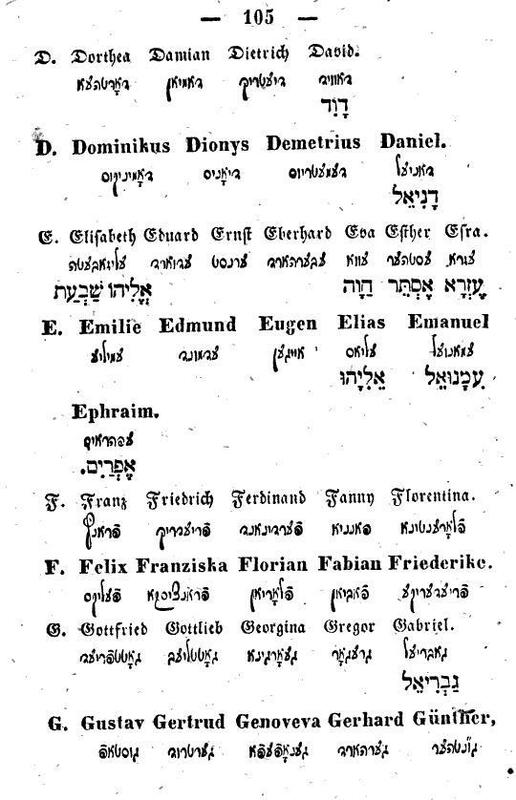 It was originally printed in the Allgemeine Zeitung des Judenthums, and translated into English where it appeared in the July 1, 1845 issue of the missionary journal Voice of Israel. This is only a footnote. Interested readers can read the complete piece here.